Summary: In the ninth blog post on the Gyakuten Saiban 6 (Ace Attorney 6 - Spirit of Justice) website, posted on June 20, 2016, background artist Ishikawa tells about how the Kingdom of Kurain (Kingdom of Khu'rain), the new setting in the game, was designed. Ishikawa had previously worked on Gyakuten Saiban 5 (Ace Attorney 5 - Dual Destinies), but because the Kingdom of Kurain was a completely new setting, it was almost like starting from scratch all over again. Included are some of the earlier designs of the kingdom. Images are taken from the source article. Copyright belongs to the respective owners. Hello everyone. Ishikawa here, of Backgrounds. For Gyakuten Saiban 6 (Ace Attorney 6 - Spirit of Justice) I worked on the backgrounds, which I also did for Gyakuten Saiban 5 (Ace Attorney 5 - Dual Destinies). When I heard we'd be working on Gyakuten 6, I thought: "I can just do what did for 5! It's going to be an easy job if I use the experience and resources I got with working on the previous game ♪"
"What? This time, the game is set abroad!?" "The Kingdom of Kurain, land of spirit channeling...!?" Who could've guessed that 6 would be set in another country? Who could've guessed a colossal job had been waiting for me: creating a mysterious country completely out of nothing! The country was set in the outskirts of Asia. A country far, far away. And the name Kurain of course reminded me of Kurain Village we all know from the Gyakuten Saiban series. 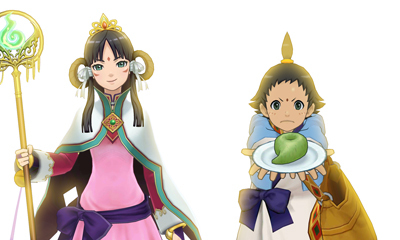 The country was supposed to have a link with Kurain Village, home of Mayoi (Maya Fey). What kind of country would it be? It would have beautiful scenary, with high mountains after another beneath a clear sky. It would have a unique culture, as it was cut-off from modern civilization. Spirit channeling would've been flourishing there, and they had trials there where they'd use spirit channeling. And a cute priestress would be dancing there. What a mysterious country. Could I really manage to create that? This is an image I drew early on. Too bad, but this too disappeared into the shadows of history. This was hard! I just couldn't envision what kind of place the Kingdom of Kurain was. No matter how much I drew, I just couldn't find the answer. I don't know...I just don't know....! Where in places is this Kingdom of Kurain!? The courtroom appears to be like a pyramid or something. And there's another big statue.. I think you can see how lost I was. In the lower right, you can find the prototype of the magataman that appears in the main game! Yes, the idea for the magataman Bokto (Ahlbi Ur'gaid) was born around this period. And I started to think while I was drawing this. Would it be delicious? What kind of people would be making it, and who would be eating it? What would the look on the faces of the people be when they ate it? It was then that I noticed I had forgotten something very important. I had forgotten about the people who were living in the Kingdom of Kurain! I had been so fixated on creating a country and buildings, I had lost sight on something important. There was no way I would be able to create a country without knowing about the people who lived there. I finally realized it. The Kingdom of Kurain wasn't something I would create. It were the people living in the Kingdom of Kurain who would do that. ~ Several months later, the Grand Court of Kurain was completed. 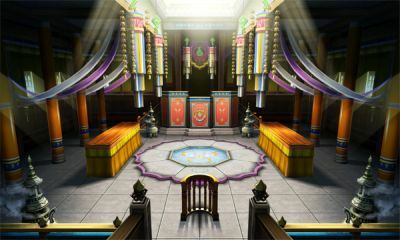 A court which was created by the people living in the Kingdom of Kurain.The solemn ambience reminds more of a temple than a courtroom. Detailed decorations, vivid colors and smoke flowing out of the incense burners. The symbol behind the judge's seat is the symbol of the Kurain religion, "the spirit-carrying butterfly." Finding the way to this point had been difficult, but I think we managed to create an atmosphere different from the Japanese court. There's a bench for the defense and prosecution, like in Japan, but they also have a space reserved for the princess priestress here. Yes, the water mirror in the center. 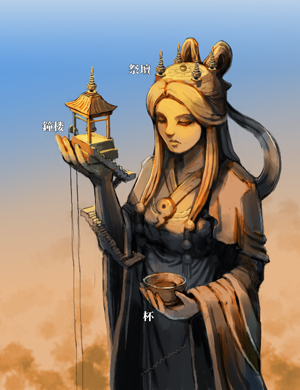 Reifa (Rayfa), the princess priestress, usually stands in front of the water mirror, performs the "Oracle of Spirits" during a trial and projects the memories of the deceased on the water surface. If you look carefully, you will notice that the shape of a magatama and butterflies are all imbedded in the decoration. You can see them as you're playing the game, so try looking for them. What kind of difficult battles will be repeated in this strange court? And what kind of truth will be revealed here!? I can't tell you here, so that is something you can look forward to during your playthrough!! Next time we'll have Nakano of UI (user interface) here. We have a new UI this time, with a Kurain theme that has a foreign touch to it. Will we hear about some secret story about how this was made...! ?